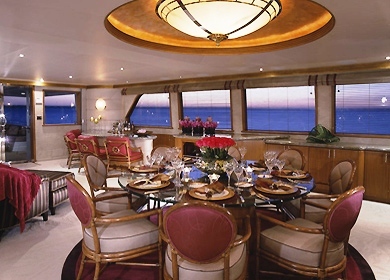 Luxury Yacht SYMPHONY II is a Westport built charter yacht launched in 2001 with interior design by Claudette Bonville. 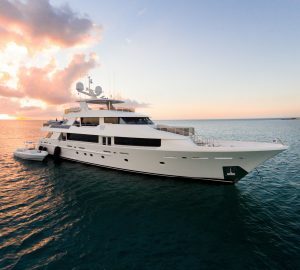 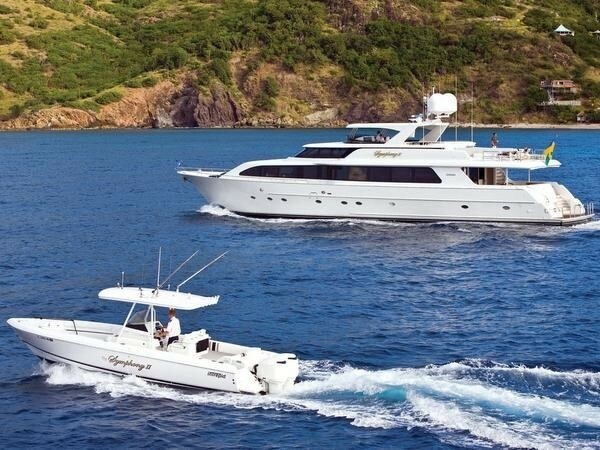 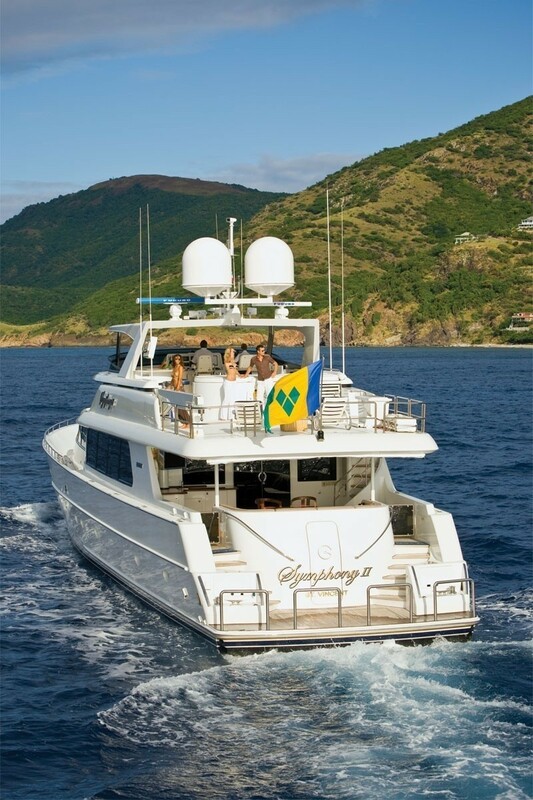 Motor Yacht SYMPHONY II has a composite hull, cruises at 16 knots and is available for yacht charters throughout the Caribbean including the Virgin Islands, St Martin, St Barts, Antigua, the Leeward islands and the Grenadines. 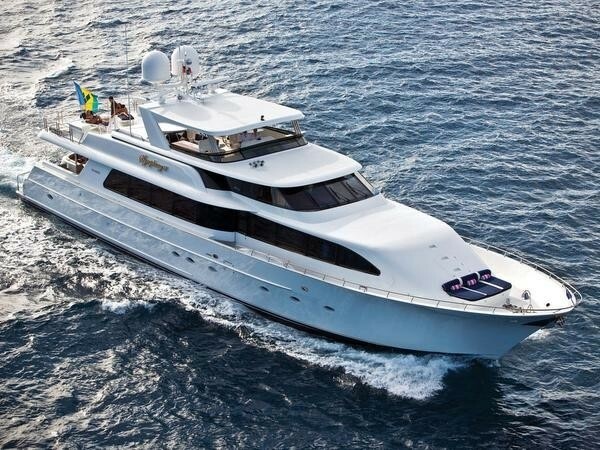 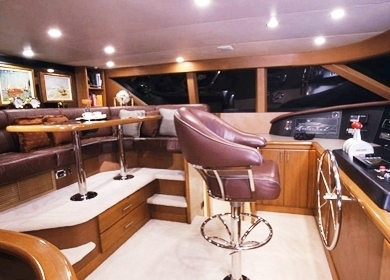 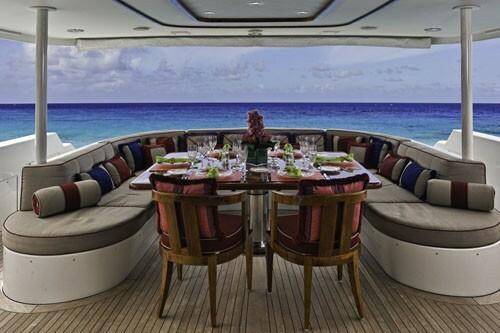 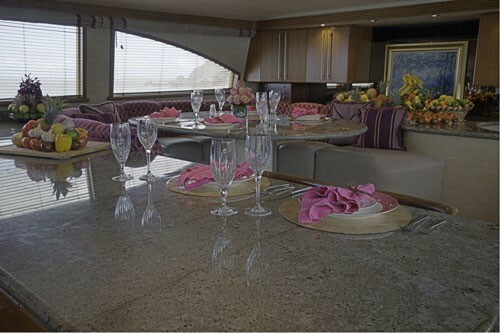 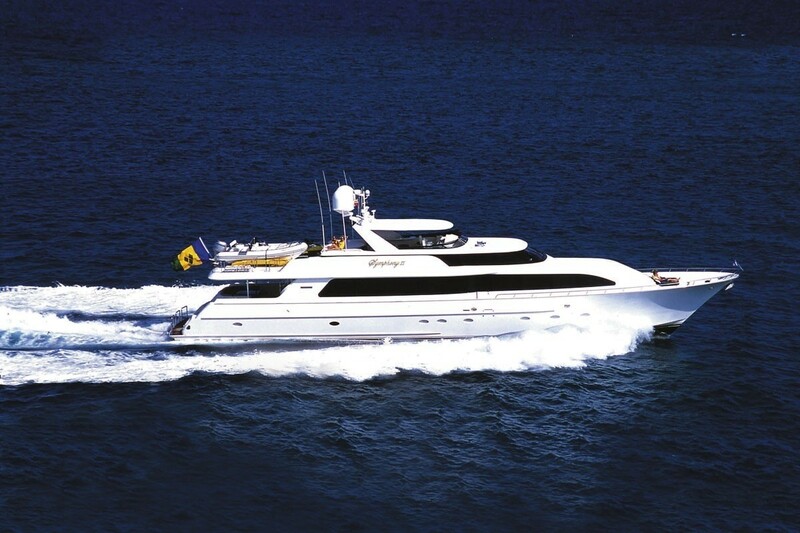 Motor Yacht SYMPHONY II is a wonderful yacht and ideal for entertaining with friends or family. 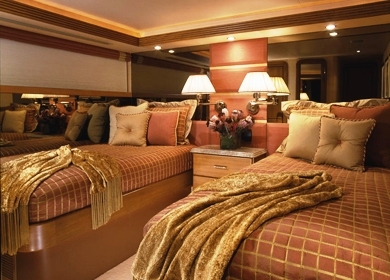 Her spacious salon and lounge is exceptional comfortable with warm elegant decor and furnishings and plenty of natural light. 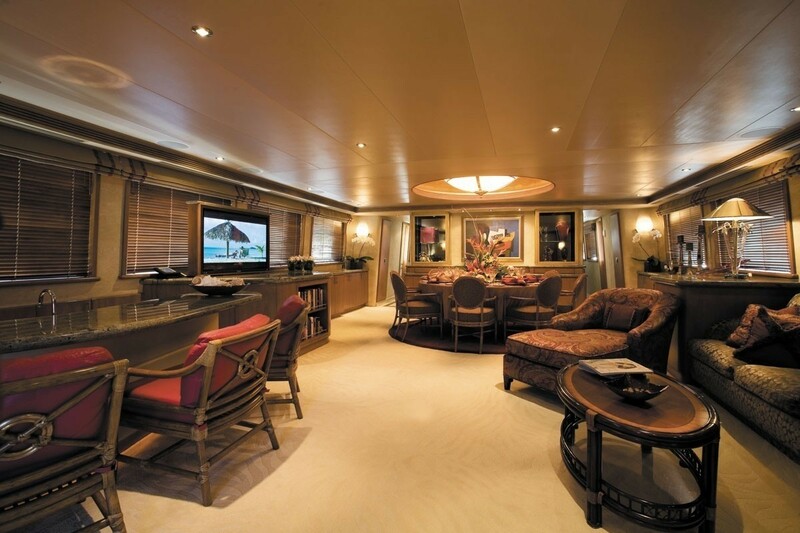 Her main salon is open style and incorporates a lounge area, a small bar and a internal dining area. 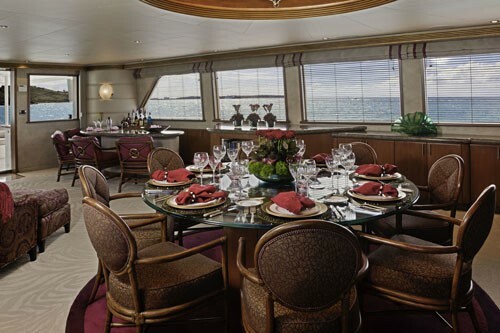 Forward of the salon is a open style galley where guests can relax whilst they watch the chef in action or discuss the menu plans of the day. 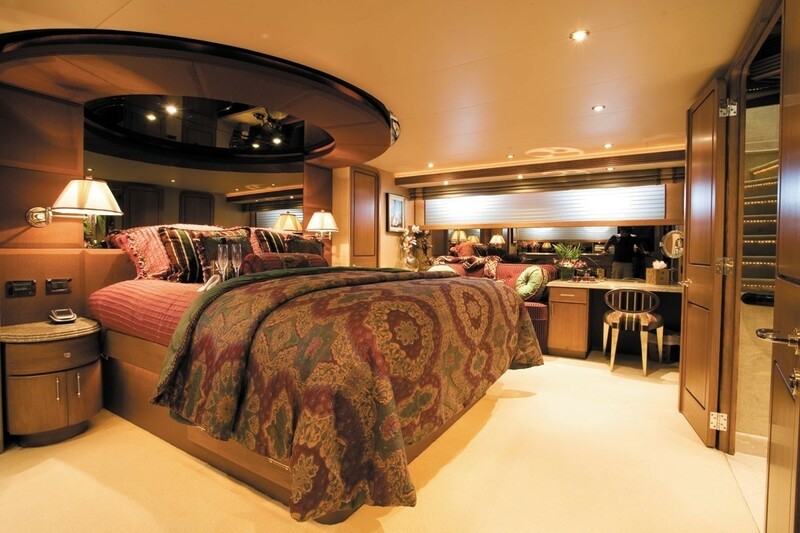 On the lower deck, eight guests can be accommodated in four spacious and luxurious furnished cabins all with ensuite bathrooms. 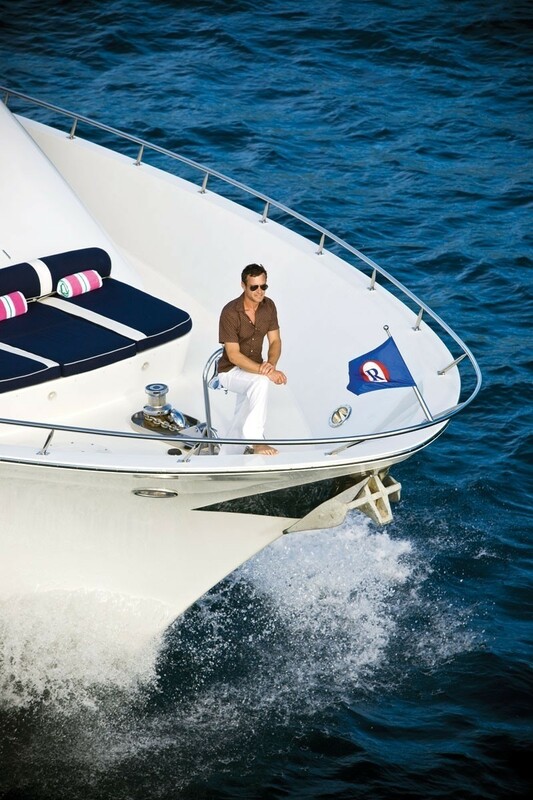 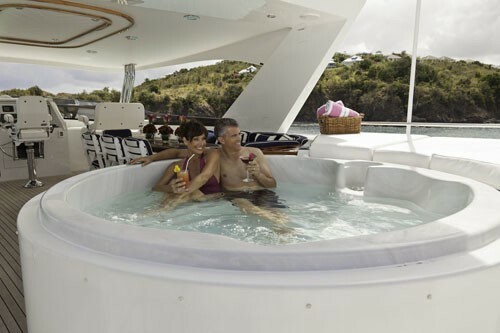 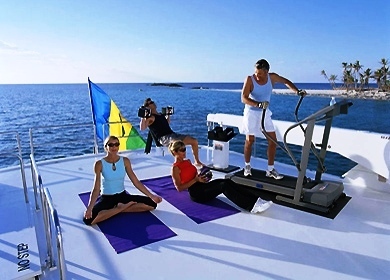 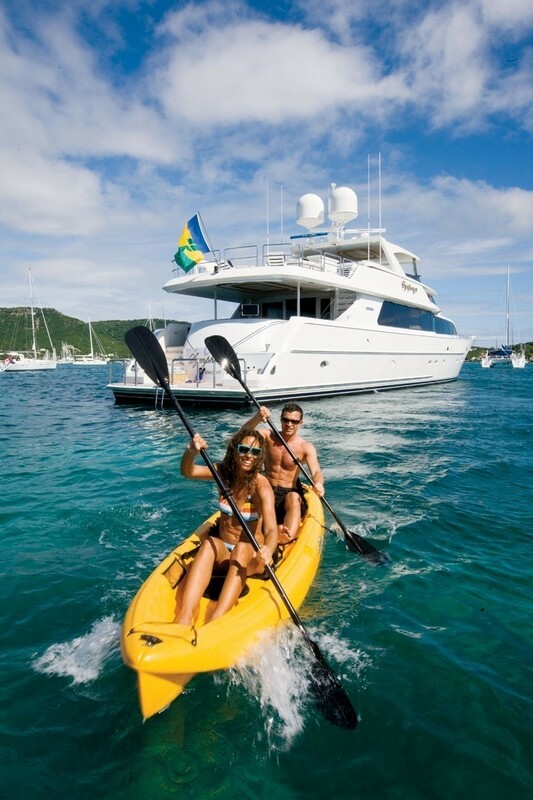 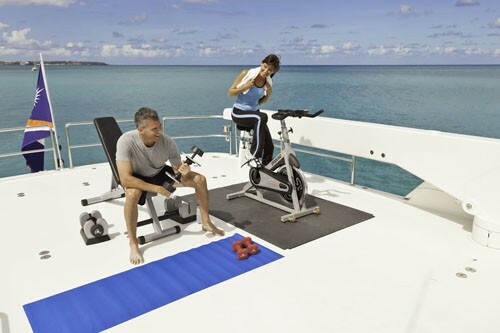 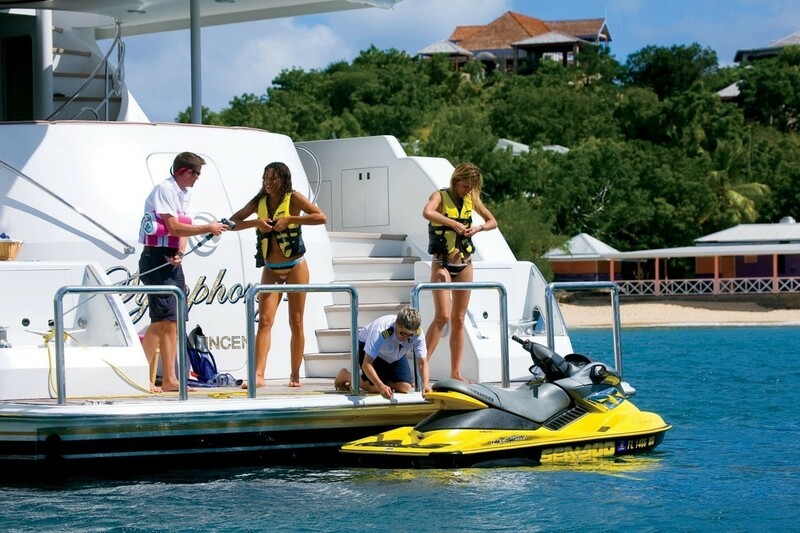 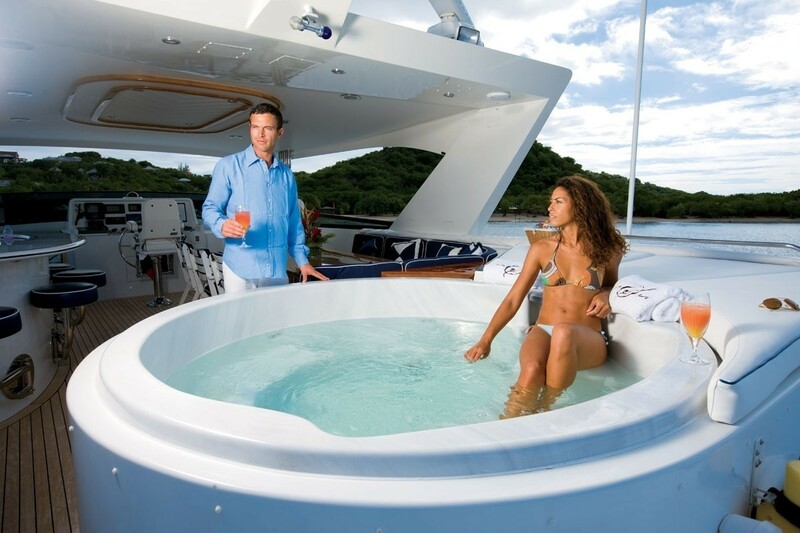 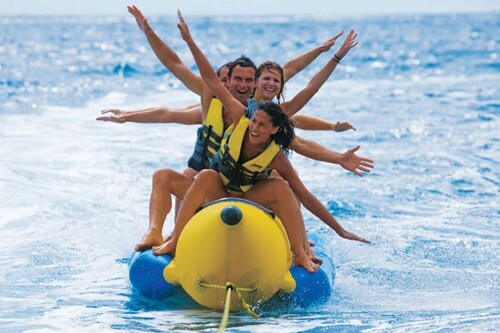 With the warm Caribbean climate, guests tend to spend most of their time on deck. 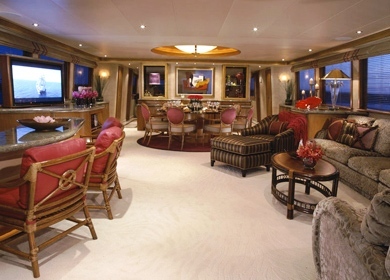 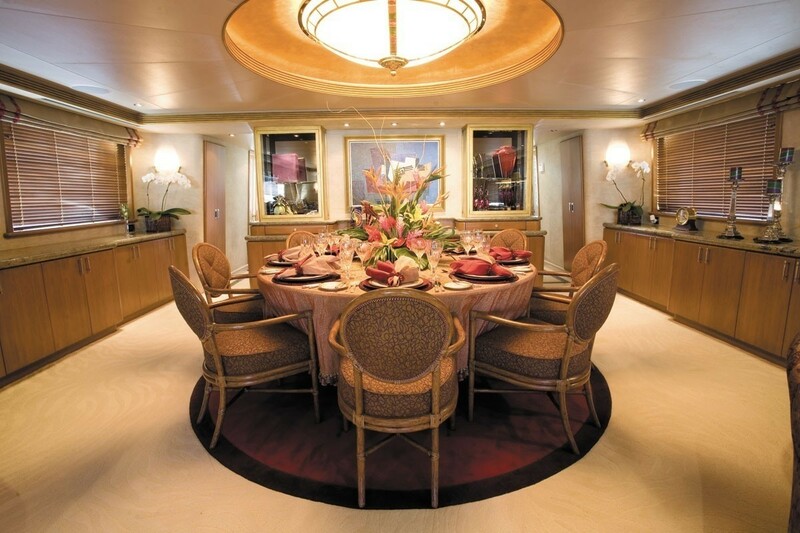 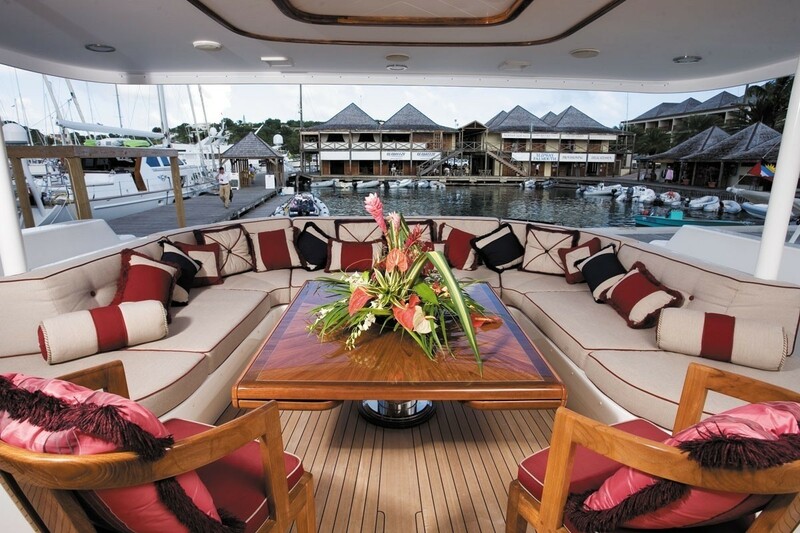 A casual lounge and dining area encompasses the lower aft deck. 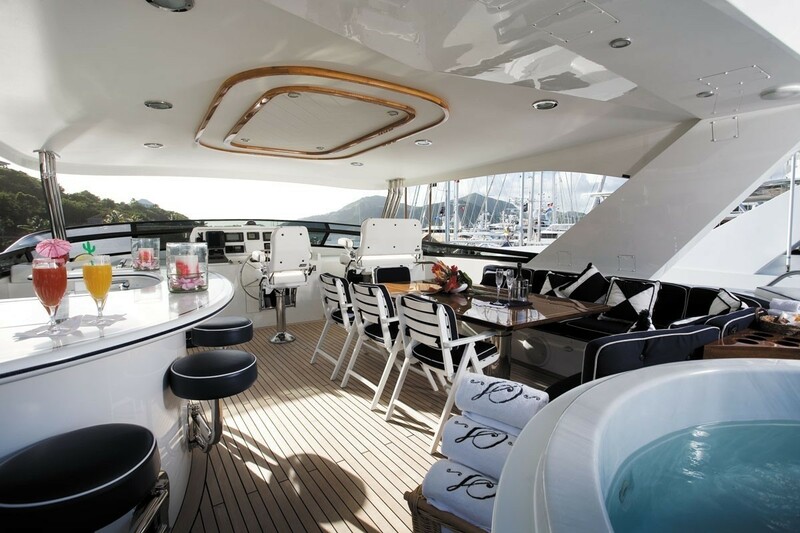 The flybridge, however is one of the best areas onboard and includes a large alfresco dining area, a bar with a large flatscreen TV, a Spa Pool and sunpads and an exercise area. 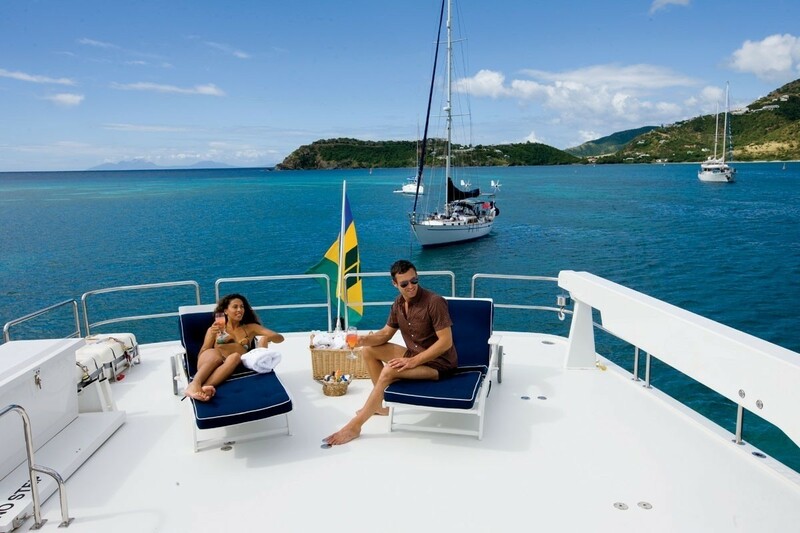 What better place to relax on charter and take in the best of the Caribbean scenery. 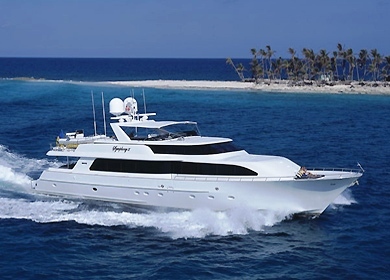 Charter Yacht SYMPHONY II is professional managed by five crew who are looking forward to welcoming guests onboard for another fabulous yacht charter season. 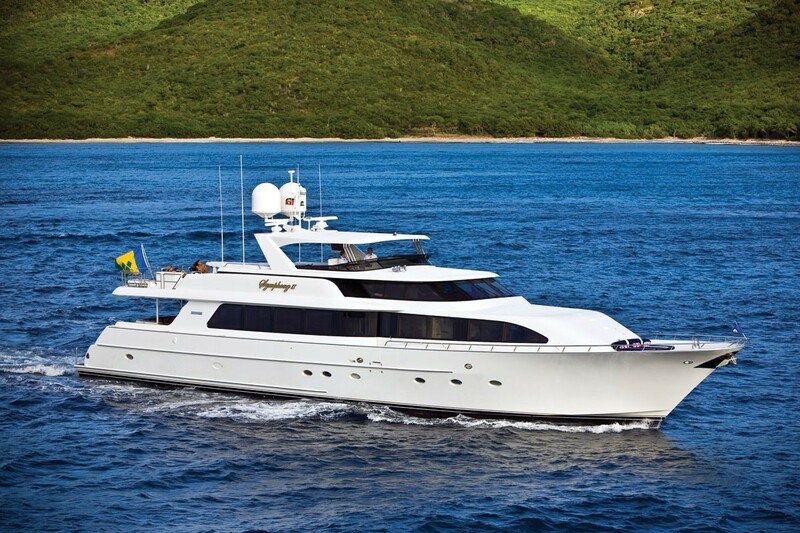 Luxury yacht SYMPHONY II has accommodation for 8 guests in 3 comfortable cabins. 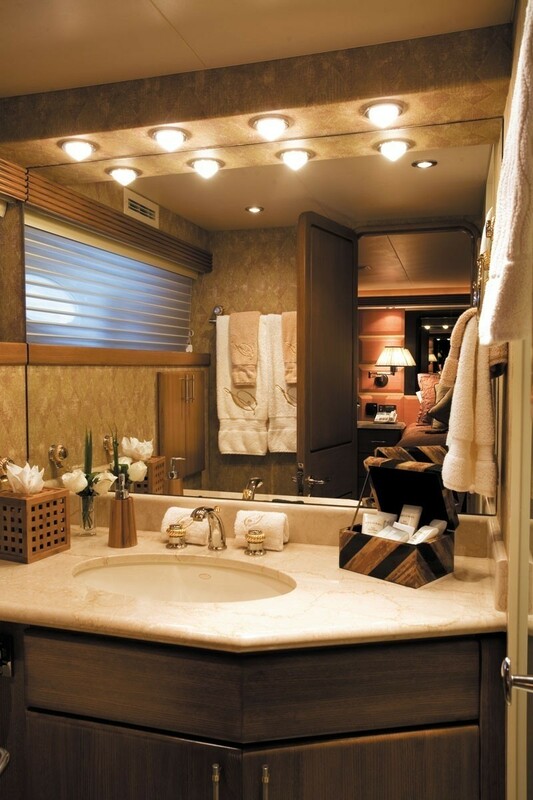 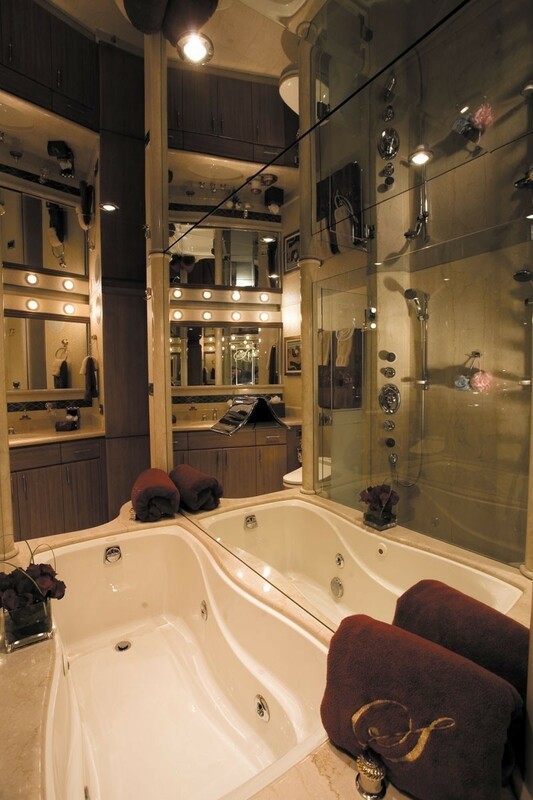 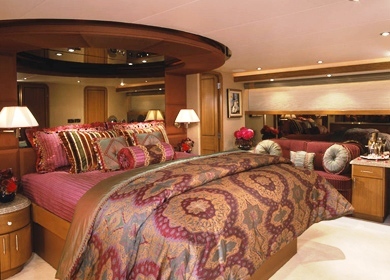 The master Stateroom is equipped with a king size bed, TV/VCR/Denon Music system with Boston speakers, walk-in wardrobe, ensuite his and her bath with whirlpool tub and shower and bidet. 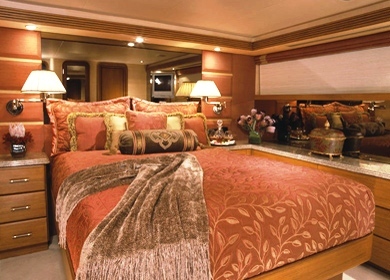 The VIP Stateroom has a Queen size bed, TV/VCR/Denon music system with Boston speakers, ensuite bath with shower and bidet. 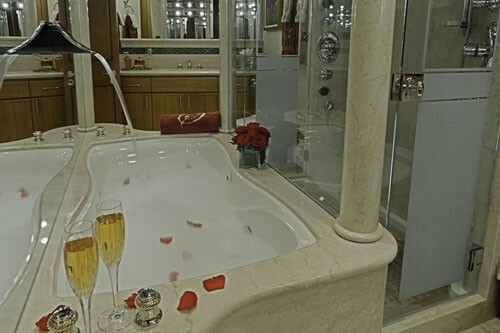 One guest Stateroom has a Queen sized bed, TV/VCR/Denon Music system with Boston speakers, ensuite bath with shower and the second guest Stateroom has twin beds, TV/VCR/Denon music system with Boston speakers, ensuite bath with shower. 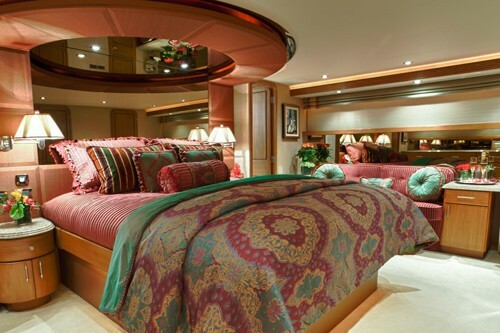 This stateroom is a twin/king bed convertible. 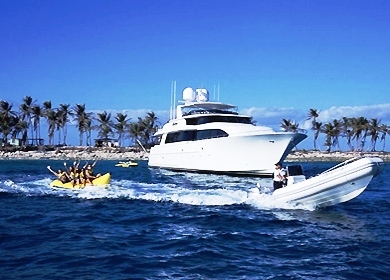 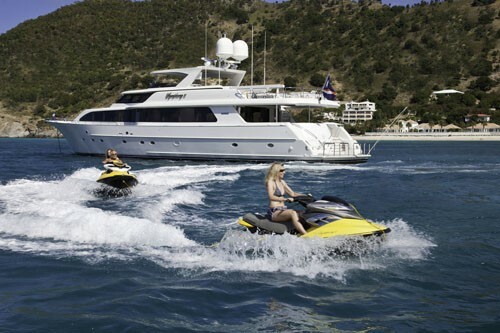 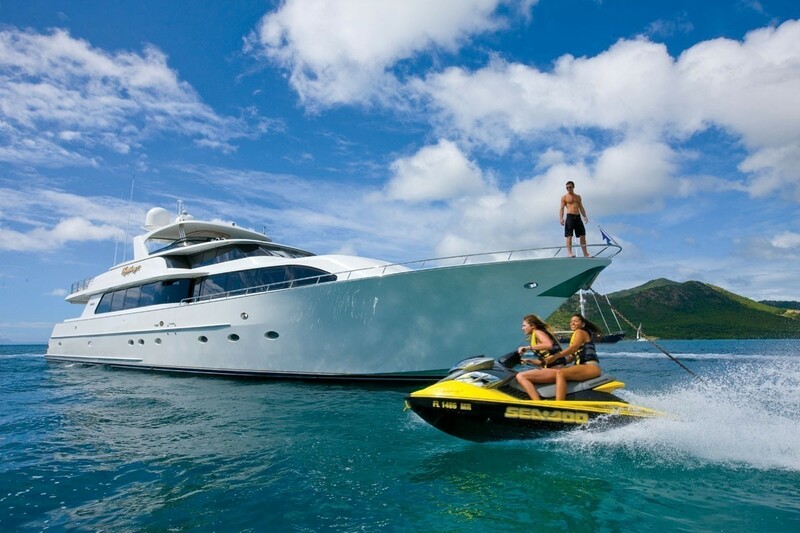 Luxury Motor Yacht SYMPHONY II has the following tenders & toys: A 30ft Intrepid 300 Open with twin 225hp Yamahas (in tow) for Caribbean, an 18ft Hard bottom inflatable Novurania, Snorkel equipment, a Spa Pool one 2 person Waverunner, 2 Kayaks, Waterskis, Wakeboard, 2 Fold up bicycles, Offshore and bottom fishing equipment, a Banana, Monster Ring, Beach equipment including a tent, chairs and barbeque; Exercise equipment including free weights, spinning bike, and a custom exercise video. 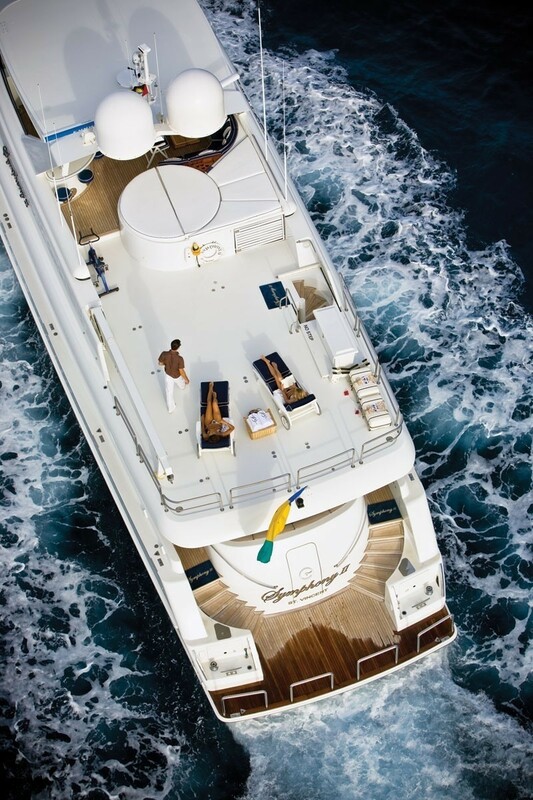 The yacht offers Rendezvous Diving Only. 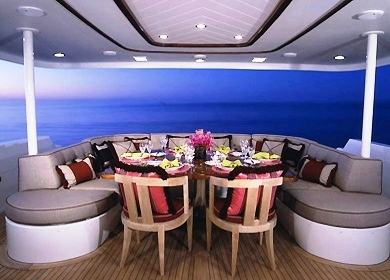 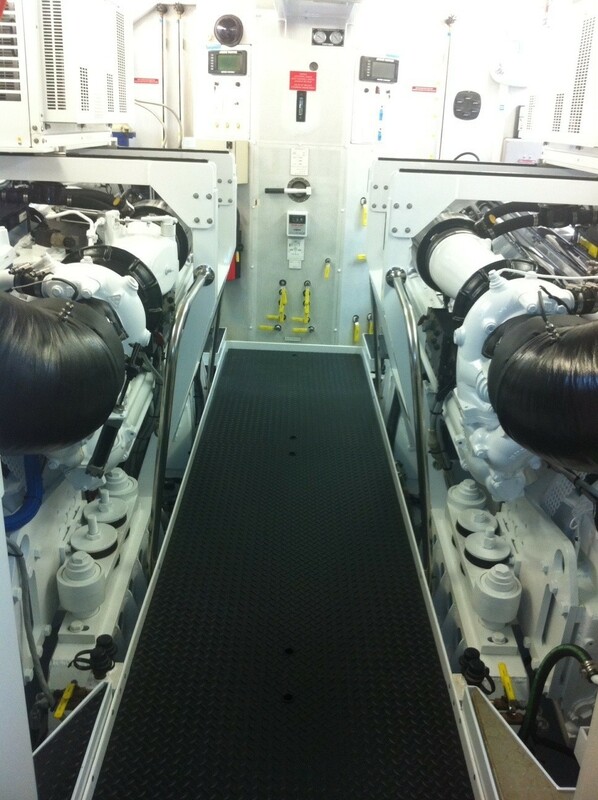 Communications equipment onboard includes: Satcom, Cell phone, Fax, V-Sat Internet. 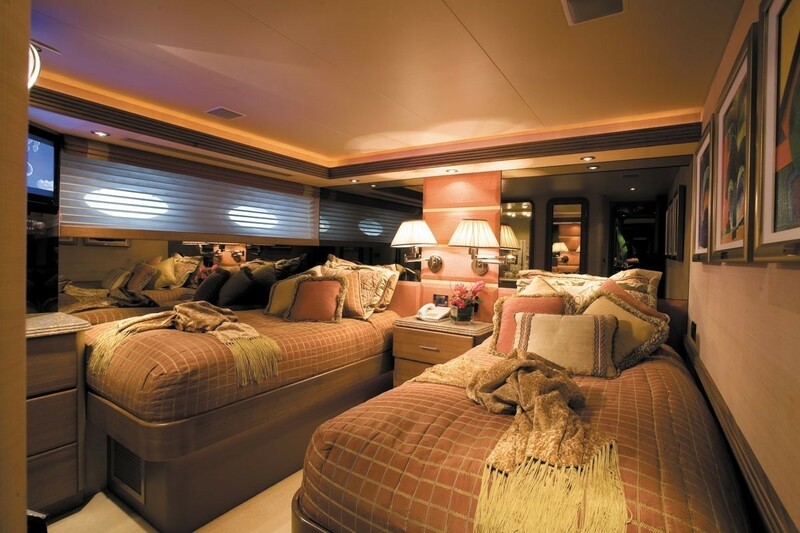 Audio Visual Equipment includes: Karaoke, CD/DVD library, PlayStation 2, XBox, Assorted board games and Satellite TV. 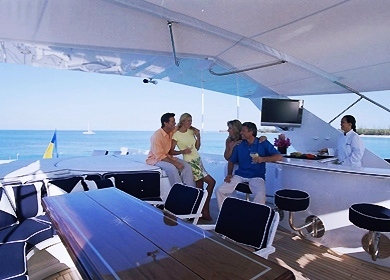 SYMPHONY II’s Audio Visual Equipment and Deck Facilities include a Creston System throughout the yacht, Satellite TV-SeaTel (with receivers covering North American & Caribbean), Karaoke, an Extensive CD and DVD library. 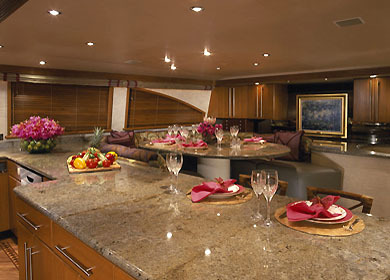 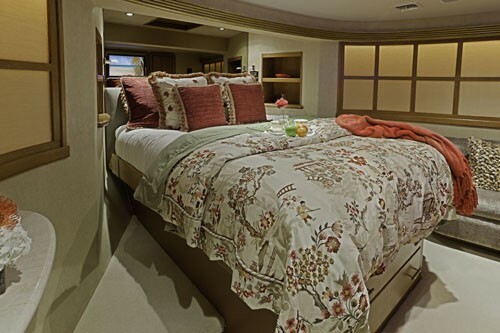 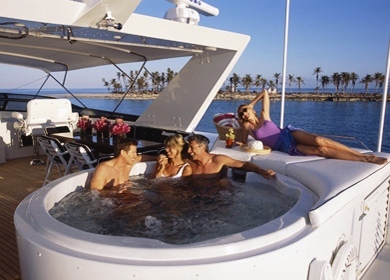 There are Flat-screen TVs in every stateroom, on the aft deck and flybridge. 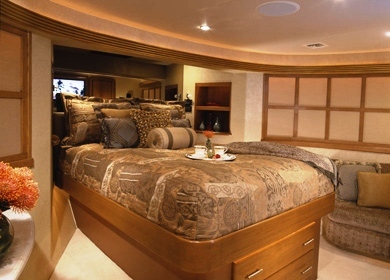 Her Main salon has enhanced viewing multi-system 50" Plasma TV with DVD/CD and surround sound plus a PlayStation 2, an XBox and Assorted board games and WII.